What is a ChatBot and how can I use it in Teams? Recently the use of Bots has become popular. Chatbots are programs that respond to everything that we introduce through a chat. Working along with Artificial Intelligence (AI) and the use of natural language recognition or image recognition, bots have become an option to be taken into account as an alternative to other user interface Big IT companies like Facebook, Google and Microsoft are already counting a lot on it. 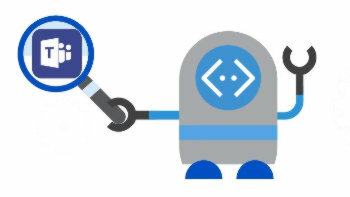 To develop our own ChatBot, Microsoft makes it easy with the Bot Builder SDK, a framework for developing Bots that can be easily integrated with the majority of Chats that allow it, such as Facebook messenger, Telegram, Skype for business and, of course, Microsoft Teams. 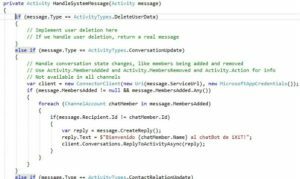 Using Visual Studio and Azure, we can have our own (and simple) ChatBot with little effort. 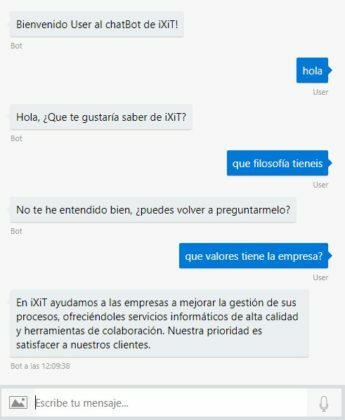 If we also use the AI ​​services offered by Azure as LUIS (Language Understanding Intelligence Service), we can have in Teams a powerful ally in the form of a ChatBot. Today most ChatBots are aimed at customer service functions, to manage orders, write appointments or reservations. For example, a ChatBot for a pizzeria can collect the requests of the customers, extracting from the conversation what pizza they want and the delivery address. The ChatBot generates the order in the pizzeria and informs the user of the price of the order and the delivery time. It can serve clients, resolve frequent questions in a more natural and comfortable way, and at any time. It allows making actions around conversations in a more natural and productive way. It is customizable for any kind of problems. We can distinguish between two types of ChatBots: the normal one and the intelligent one. 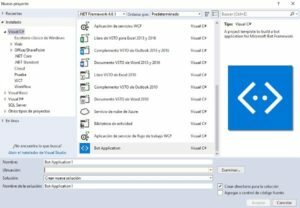 El ChatBot normal es algo similar a una aplicación de consola, en la que solo se reconocen instrucciones preconcebidas y con una estructura/patrón estrictos. The intelligent ChatBot is based on automatic learning techniques and / or other Artificial Intelligence systems to understand the user in a more natural way. Check the status of the report and modify it. Reassign a task to another employee. How to control the use of a ChatBot in Teams? A ChatBot in Microsoft Teams can be assigned to a private chat or channel. In addition, the use of bots can be managed from Office 365. If we want an extra security point, using the Microsoft Bot Framework we can use the so-called “BotAuth”, a package that allows authorization from any provider that supports the OAuth2 authorization protocol.